Jeannie was a woman who lived and loved with her full heart. Her smile brightened up every room she walked into. She was funny, witty, strong and a woman of beauty and grace. Those of you who were blessed to know her know what an enormous loss she leaves behind. She passed far before any of us were ready for her to go and before she was ready to say goodbye. 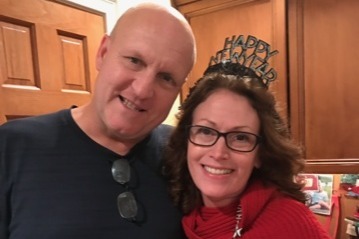 Jeannie fought a tough fight to the very end but unfortunately succumbed to cancer on Friday, September 28th at Mount Sinai Hospital in N.Y.
Jeannie was a daughter, sister, wife, mother and friend to many in her community. Through our love of Jeannie we look to support Don and their beautiful children Caity, Matthew, Peter, and Donald with the hope of making life, even, slightly easier over the coming months and years. Jeannie and Don are the kind of people that put their needs aside to help others. Don, a high school math teacher in Colonia, NJ has been a volunteer coach for almost every sport Westfield offers. He volunteers his time coaching baseball and basketball and has tutored from grade school through high school. Helping to get many kids into college tutoring for the SAT’s. Education always comes first in the Meixner household. While they all take school seriously, they each have excelled in extracurricular activities. Caity, is a recent graduate of JMU and is now working for a marketing firm in New York. Matt is a sophomore in high school and very active in Westfield High School’s theater program. Peter, an eighth grader at Roosevelt Middle School is an excellent student and also an incredibly talented and natural athlete. Donald, a fourth grader, has the sparkle in his eyes of someone who has had unconditional love. He loves to learn and puts all of is 10 year old boy energy into everything he does!! Jeannie played so many roles - and there are so many holes that will need to be filled in her absence. While we are not all able to physically be present to help, your generosity given in Jeannie’s name, will help to provide for her husband and children where she is no longer able. We have set this page up to raise monetary funds to support Don and the kids with such things as rent, bills, medical bills, sports, education and so many more things that are yet to be seen. We plan on setting up a trust for the kids for their education. Although Don is uncomfortable with receiving the support he genuinely needs, he realizes that financial help is necessary to cover some present and future expenses, especially education. He wants everyone to know that he can never express his heartfelt gratitude for the kindness and compassion that he has received from his community. Thank you for loving and supporting the entire Meixner family as they grieve this tragic loss. Your prayers, good wishes and support are very much appreciated. A big heartfelt THANK YOU to everyone who donated last night and came to see Better Late play at Frenchy's. We were able to raise and additional $550 dollars for the Meixner family.